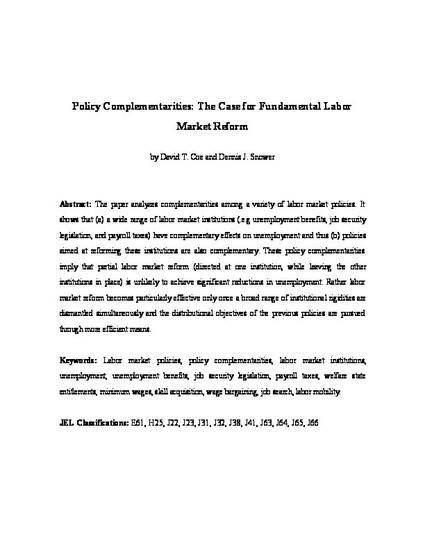 The paper analyzes complementarities among a variety of labor market policies. It shows that (a) a wide range of labor market institutions (.e.g unemployment benefits, job security legislation, and payroll taxes) have complementary effects on unemployment and thus (b) policies aimed at reforming these institutions are also complementary. These policy complementarities imply that partial labor market reform (directed at one institution, while leaving the other institutions in place) is unlikely to achieve significant reductions in unemployment. Rather labor market reform becomes particularly effective only once a broad range of institutional rigidities are dismantled simultaneously and the distributional objectives of the previous policies are pursued through more efficient means.